Jewish & Kosher | What’s The Deal? 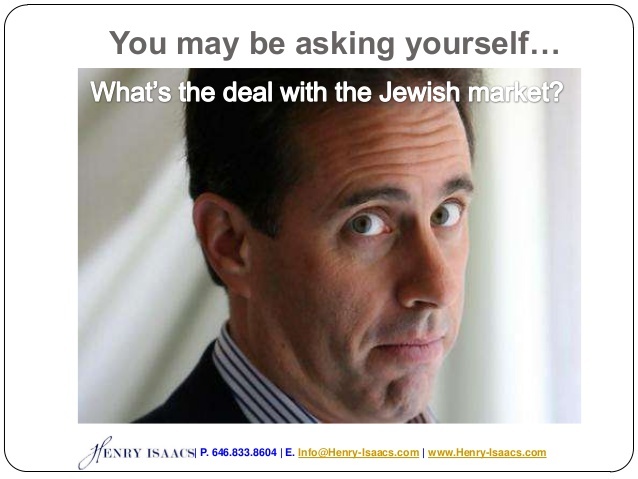 Sometimes the best way to describe Jewish and Kosher is through a presentation that covers some of the burning questions out there. So we created one that helps say exactly what people are thinking and wondering. Yes, it may be a bit self-serving (we are a business after all!) but some of the slides show how the Jewish and kosher market is a group you don’t want to overlook these days! New York…It will be three months before kosher shoppers prepare for the Jewish New Year at the end of September, which is prompting retailers to create “mini-holidays,” as one distributor put it, in between the just concluded Shavuos holiday and Rosh Hashanah. Many retail ads in the New York area are focused on marketing meats, with some using the opportunity to tout their better quality meats or even to “educate” customers about better cuts. This is in preparation for the upcoming summer BBQ season. In late July and early August, the marketing will shift to dairy menus for the Nine Days, marking the mourning period for the destruction of the First and Second Temples. One retailer told Kosher Today that he is actually “thrilled about the late date of the High Holy Days this year because it gives me two shots at major shopping periods.” He explained that he intended to market the late August – early September period as the restocking period for returning vacationer and back to school shoppers and then immediately (by mid-September) segue into Rosh Hashanah sales. But this summer period is also used by chains like Price Chopper to attract travelers enroute to Upstate New York and Canadian destinations, by independent kosher supermarkets like Pomegranate to promote orders that “summer bachelors” take with them over the weekend to their vacationing Catskill families, by Catskill retailers to lure vacationers and by on-line grocers to ship kosher foods to the various destinations that are frequented by kosher vacationers. The objective for all categories of retail grocers is not to lose the summer months.